Blowout Sale! Free Shipping Included! Save 52% on the BOSTANTEN Women's Leather Designer Handbags Tote Purses Shoulder Bucket Bags Taro Pink by BOSTANTEN at Style Hoster. MPN: BL1164391Ktaro pink. Hurry! Limited time offer. Offer valid only while supplies last. [Material]: Top Layer Cowhide Leather, high quality light gold hardware. Come with metal magnetic buckle closure for extra security. The removable pouch use durable fabric lining. It makes the handbag noble, and it highlights your feminine elegance. [Dimensions]: (L)10.35" x (W)5.9" x (H)12.7" inch, and the weight is 0.84 kg / 1.85 pounds. The inner removable purses is about (L)9.84" x (W)4.92 "x (H)9.84" inch. [Structure]: Internal structure is one main compartment and one removable pouch. And the removable zipper pouch including 1 main pocket+1 inner zipper pouch + 2 slip pockets, one of which is a cell phone pocket and one is a ID card slot. External structure including 2 side slip pockets and 2 metal magnetic buckle pocket that one in the front and the other in the back. [Feature]: Two shoulder straps, one of them is leather, one is woven, you can according to your liking more change strap style! The two straps approximately 10.23 inch, the long strap can be used as a single shoulder strap. 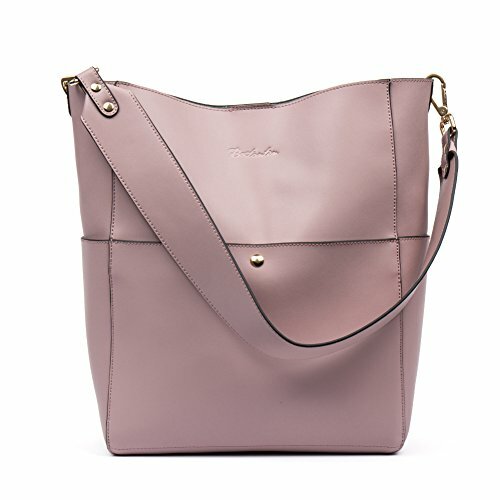 [Design]: The bucket bag made by professional artisans, appearance concise, atmosphere and powerful. Large capacity designed allow you can comfortably hold an iPad, iPhone6s Plus, wallet, cosmetic, and other daily things, perfect to use as daily handbags for working, shopping, or dating. If you have any questions about this product by BOSTANTEN, contact us by completing and submitting the form below. If you are looking for a specif part number, please include it with your message.